All VMworld 2015 session recordings now available to the general public » Welcome to vSphere-land! I was looking through the 2015 VMworld session recordings looking for a particular session on VVols and backups and discovered that I no longer had to log into my account as a VMworld attendee to view the sessions. VMware always limits the VMworld session recordings to paid attendees except for some select sessions that they release on YouTube shortly after the event. Typically at some point VMware will lift the restrictions so anyone can view the sessions right before the next year’s VMworld. Not sure when they did that this year but it looks like anyone can access last years sessions right now. 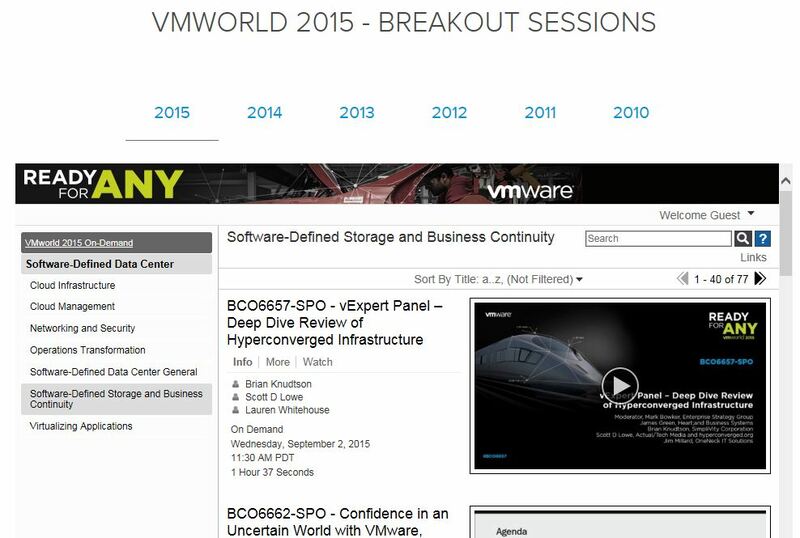 So head on over to the VMworld 2015 session page and enjoy the hours and hours of great content that exists there.